On Friday 12/10/2018, the Aarhus Convention Compliance Committee (ACCC) communicated its final findings to the parties involved in the complaint launched by Greenpeace in 2014 on the design lifetime extension of the Borssele Nuclear Power Plant. The findings will be submitted for confirmation to the 7th session of the Meeting of Parties in 2021.This decision represents a major step in the implementation of the Aarhus Convention in Nuclear. Find here the full analysis by Jan Haverkamp, vice-chair of Nuclear Transparency Watch, nuclear energy and energy policy expert for Greenpeace, who filed the complaint for Greenpeace Netherlands. The ACCC “considers it inconceivable that the operation of a nuclear power plant could be extended from 40 years to 60 years without the potential for significant environmental effects. The Committee accordingly concludes that it was “appropriate”, and thus required, to apply the provisions of article 6, paragraphs 2-9, to the 2013 decision amending the licence for the Borssele NPP to extend its design lifetime until 2033.” (point 71)This means that it can no longer be argued that nuclear life-time extensions or Long Term Operation has no environmental effects. The Netherlands must “take the necessary legislative, regulatory and administrative measures to ensure that, when a public authority reconsiders or updates the duration of any nuclear-related activity within the scope of article 6 of the Convention, the provisions of paragraph 2 to 9 of article 6 will be applied.” (Recommendations, point 89) This means that for every coming decision, this decision needs to be informed by public participation that concerns also the environmental impacts of longer operation of the NPP. During the third panel in the ENSREG meeting held on 29 June in Brussels, Jan Haverkamp presented the position of NTW concerning the life-time extension of nuclear power plants in Europe. As the lack of fund for decommissioning is used as a justification for life-time extension of nuclear power plants, our concern is that economic arguments interfere with risk management. NTW stand is that citizens have a natural, legal, moral and logical right to be consulted in the decisions concerning life time extension of NPPS. The logical instruments for their consultation and participation are the Espoo and Aarhus Conventions and (transboundary) environmental impact assessment. Download the full presentation of Jan Haverkamp here. CEE Bankwatch Network and Nuclear Transparency Watch with Members of Parliament asked the European Commission, as an opinion-making party of relevant international conventions, to provide leadership and express its clear support for the findings of relevant committees during the upcoming Meetings of Parties of Espoo Convention in June and of the Aarhus Convention in September, in favour of a coherent application of the Espoo and Aarhus Conventions to nuclear lifetime extensions. Attached please find a joint letter of 18 members of the European Parliament, Nuclear Transparency Watch and the CEE Bankwatch Network, which is calling for a firm position leading to more nuclear transparency, public engagement and safety across Europe. How much will it really cost to decommission the ageing French nuclear fleet ? The issue of decommissioning costs is a key challenge in the nucear sector. Perhaps surprisingly, a recently published French Governmental report on Faisabilité technique et financière du démantèlement des infrastructures nucléaires, from Le Commission du Développement Durable et de l’Aménagement du Territoire, Assemblée Nationale, has just blown a significant hole in the French decommissioning strategy. In late January this year, on the last day of the Commissions work, the Committee took evidence from the EDF head of decommissioning and me. Given the Commission had been working on this for months, and had listened to mounds of complex data, I decided to cut to the chase and make as clear an argument as I could. What follows is that evidence. How much has France, Germany and UK set aside for decommissioning ? Whereas Germany has set aside €38 billion to decommission 17 nuclear reactors, and the UK Nuclear Decommissioning Authority (NDA) estimates that clean-up of UK’s 17 nuclear sites will cost between €109 – €250 billion over the next 120 years – France has set aside only €23 billion for the decommissioning of its 58 reactors. To put this in context, according to the European Commission, France estimates it will cost €300 million per gigawatt (GW) of generating capacity to decommission a nuclear reactor – far below Germany’s assumption at €1.4 billion per GW and the UK of €2.7 billion per GW. How can EDF decommission at such low cost? Even EDFs €23 billion limited provision for decommissioning and waste storage is a large sum of money for a company that has huge borrowings and enormous debt, which is currently running at €37 billion, Standard and Poor and Moodys (the two biggest international credit rating agencies) have already downgraded EDFs credit-worthiness over the corporations potentially ill-advised decision to go ahead with attempting to construct two more of the failing Areva reactor design (the EPR) at Hinkley Point, UK. And any significant change in the cost of decommissioning would have an immediate and disastrous impact on EDFs credit rating – something that the debt-ridden corporation can simply not afford. Then there’s EDF’s existential problems at France’s high-level waste storage and reprocessing facility at La Hague, where spent nuclear fuel stores are reaching current cooling capacity limits. This means La Hague may now have to turn away spent fuel shipments from Frances reactor fleet. In any case, since ASN have identified safety problems with some spent fuel transport flasks, spent fuel transport to La Hague has substantially slowed. All this means the build-up of spent fuel at nuclear sites across France, with the associated problem of cooling the spent fuel at nuclear sites during dry summer periods, with all that means for further escalation of rad-waste management costs. Happily, and perhaps unexpectedly, when the Commission publishes it’s final key findings, they come down on the side of those who voiced concerns about EDFs provisioning for reactor decommissioning and waste management does not include “obvious under-provisioning” regarding “certain heavy expenses”, such as taxes and insurance, remediation of contaminated soil, the reprocessing of used fuel and the social impact of decommissioning. The Commission found that the clean-up of French reactors will take longer, be more challenging and cost much more than EDF anticipates. The Commission reports that EDF showed “excessive optimism” in the decommissioning of its nuclear power plants. “Other countries have embarked on the dismantling of their power plants, and the feedback we have generally contradicts EDF’s optimism about both the financial and technical aspects of decommissioning… “The cost of decommissioning is likely to be greater than the provisions”, the technical feasibility is “not fully assured” and the dismantling work will take “presumably more time than expected”. 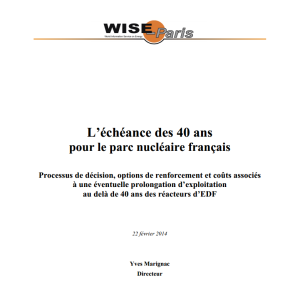 Critically, the Commissions report says that EDF arrived at its cost estimate by extrapolating to all sites the estimated costs for decommissioning a generic plant comprising four 900 MWe reactors, such as Dampierre, noting that: “The initial assumption according to which the dismantling of the whole fleet will be homogeneous is questioned by some specialists who argue that each reactor has a particular history with different incidents that have occurred during its history”. Soon EDF will have to start the biggest, most complex and costliest nuclear decommissioning and radioactive waste management programme on earth. It seems very likely that (for various reasons not unassociated with it’s current bank balance) EDF may have seriously underestimated the real challenges and costs, with serious consequences for its already unhealthy balance sheet. This will have profound consequences for the French State, who underwrite EDF. The decommissioning of nuclear facilities is one of the major challenges of the coming decades for Europe. A precise agenda of decommissioning is not available yet, but Europe will face a large number of closed down facilities. It is inevitable that facilities will stop, either because their planned lifetime comes to an end, otherwise because of economic, industrial or security reasons. According to statistics from the World Nuclear Association (association gathering producers of energy coming from nuclear power), 14 reactors have stopped operating as a result of an accident or a serious incident, 22 were shut down because of political choices and 97 were closed for economical profitability reasons. Preparations should be made immediately to manage the massive decommissioning coming. The European Union has currently 131 nuclear plants in operation, 75% run for over 27 years, while the technical lifetime of a reactor ranges from 30-40 years, even though some will be extended to 50-60 years of operation. Europe has already several closed down reactors, but none of these plants have been completely decommissioned. The International Atomic Energy Agency (IAEA) recognizes the final shutdown of 29 reactors in Britain, 28 in Germany, 12 in France, 4 in Bulgaria, four in Italy, two in Lithuania, one in the Netherlands, three in Slovakia, two in Spain, three in Sweden. When decision of shutting down a power plant is taken, there’s still a decision to make about the strategy to adopt: immediate dismantling (meaning starting the operations as soon as possible after a facilities’ shutdown), deferred dismantling (waiting for the natural radioactive decay) or an entombment (pouring concrete over the entire building). What are the strategies mainly chosen in Europe? The term decommissioning covers the whole ranges of activities executed after the cessation of a facility: dismantling of structures, systems and components, soil remediation, recycling, confinement, removal and disposal of produced spent fuel and radioactive waste. Do European countries control the technical feasibility of such a process? What are the experience feedbacks? On which experiences can they rely on to face the massive decommissioning process to come? How can a territory be prepared for decommissioning? What are the possible projects of replacement? Will the European sites return to grass, a « green field » state which means to make the land available for a subsequent use, or to the status of « brown field », that allows an industrial reuse of the land? The final goal of decommissioning is a very important issue because it will have an impact on the general cost and on the quantity of waste to manage. Decommissioning is a major safety issue. Decommissioning consists in deconstructing facilities that have been nuclear facilities and will remain so as long as they are not completely dismantled. This raises important issues in terms of safety and radioprotection of the workers of the sector as well as the whole population and the environment. Classical risks become significantly greater during decommissioning operations due notably of decommissioning operation of electrical installations as well as handling, carvings and deconstructions works carried out. How to evaluate the safety of the decommissioning process? What will be the immediate impact and long-term impacts on the health of workers? Will some epidemiological studies be considered? The dismantling of a nuclear installation involves the creation of waste and effluents can be very different from those produced during the operational phase. The most harmful waste, spent fuel, has very strong safety issues. As for the waste of very low activity, which represents little danger, will be produced in much larger quantities. The decommissioning waste pose disposal, management and also of transport issues. Moreover, apart from the technical, health and environmental related difficulties, cost and financing of such projects appear as essential elements. Large uncertainties exist about the costs and duration of a decommissioning that remain difficult to estimate. Several questions arise: how are achieved the assessments of decommissioning costs, and what are the results? Are the estimates made in Europe reliable and useful? Concerning financing, the “polluter pays” principle is the current basis; the funding responsibility leans primarily on the operator of the facility. What are the financing practices in Europe (co-financing, shared control, financial reserves)? Are the operators’ financial reserves sufficient? What happens in the case of an operator’s financial default, would the consequences fall upon the States, and thus on the taxpayers? Risk assessment related to decommissioning is mainly based on the operator’s techniques. It is therefore essential to have legal measures ensuring transparency of processes throughout the European Union. Are there control means independent from nuclear operators? Are the responsibilities of decommissioning clearly drawn and transparent? Transparency is essential to involve the citizens to decommissioning projects. The social and environmental issues related to the decommissioning of nuclear plants pose many questions among people living nearby the sites. What are the conditions for effective information and public participation in decisions about a nuclear facility’s decommissioning? Thanks to the European Union and the creation of the Aarhus Convention, it is possible to resort to participatory democracy to resolve some environmental issues, including those concerning nuclear installations. Will Environmental impact Assessment available for the public? Will public consultation be organized in the case of decommissioning process? – To give participants a scientific background on decommissioning processes and challenges. – To review the different practices in EU MS and give an overview of the situation in Europe. – To assess the possibilities for public participation regarding policies responding to decommissioning. SESSION 2: Decommissioning costs: What are the costs? Who is responsible? The European watchdog organisation Nuclear Transparency Watch(NTW) warned today the Belgian federal minister of Energy Marie-Christine Marghem, that her legislative proposal to extend the lifetime of the 40 years old Doel 1 and Doel 2 nuclear power reactors threatens to break international rules for transparency. If the right of the public to participate in an environmental impact assessment will not be respected, NTW will seek advice on initiating a formal complaint to the Compliance Committee of the Aarhus Convention. End February 2015, the Belgian Council of State warned the Belgian Energy minister that lifetime extension of old nuclear power reactors cannot be decided without organising an Environmental Impact Assessment (EIA) and a national and transboundary public consultation process, as prescribed by the European Directive 2011/92/EU and the Aarhus and Espoo conventions, both signed and ratified by Belgium. On 5 and 6 May 2015, the final discussions before the vote on the Doel 1 & 2 lifetime extension will take place in the Economy Commission of the federal parliament. 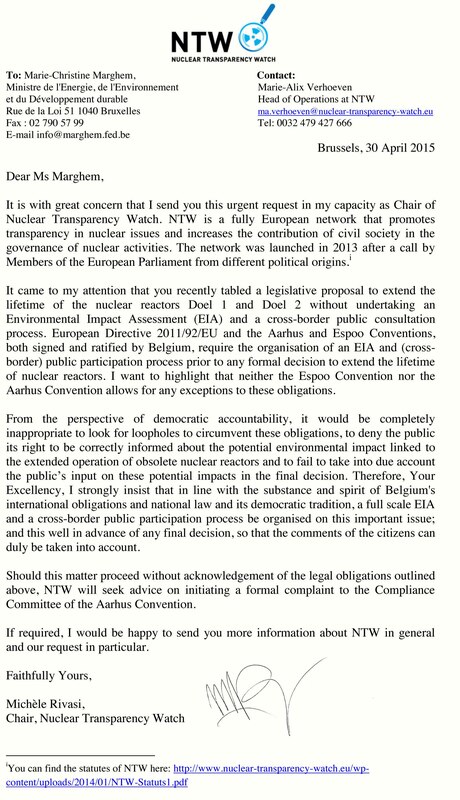 Before these discussions, NTW chair, Michèle Rivasi, sent today a letter to the energy minister to stress the importance of respecting international obligations to organise a full scale EIA and a cross border public participation process in advance of any final decision. 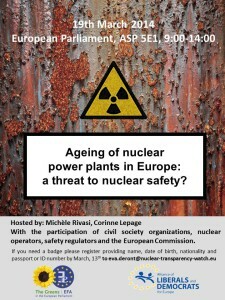 A half-day conference was organized in the European Parliament in Brussels to address the issue of the ageing of nuclear power plants in Europe and its impact on nuclear safety. 19th March 2014 in the European Parliament. Download the minutes of the workshop. Download the agenda of the workshop. Around one third of the European nuclear reactors are today over 30 years old. All European nuclear regulators and utilities are facing problems linked to this ageing of the fleet, which should be broadly understood as the physical degradation of structures, system and components (SSC) as well as the obsolescence of technologies, design, and losses in the transmission of human know-how. Ageing directly impacts the possibilities of lifetime extension of nuclear facilities, one of the two key challenges (with nuclear waste) identified by the European Commission in its Strategic Energy Technology Plan. In this framework, the Commission proposed to add new Community safety objectives to the existing safety directive1 so that plant life-time extension “does not expose the workers and the public to additional risks”. The importance of ageing has also been directly acknowledged by the European Nuclear Energy Forum and more specifically by its Working Group on risks, which is drafting a proposal for a Commission recommendation on “harmonized conditions for the safe long-term operation of Nuclear Power Plants (LTO) in the European Union”2. This proposal defines among others the responsibilities of license holders as well as of regulatory authorities in charge of implementing harmonised safety LTO conditions. For their part civil society organizations have taken the topic of ageing and its impacts on safety in hand but with few possibilities of expression. 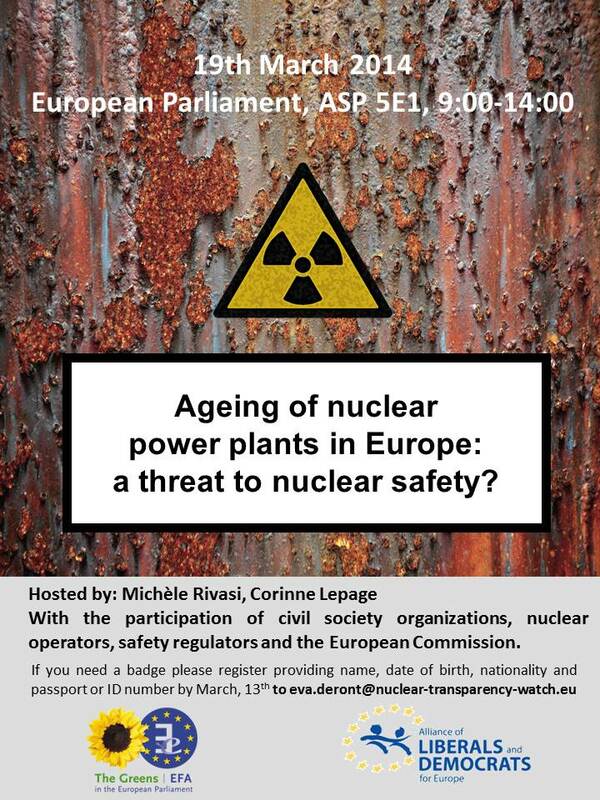 In this context, Michèle Rivasi (vice president of the Greens-EFA group), chair of Nuclear Transparency Watch, is organizing an open discussion with MEPs, representatives of the European institutions, regulators, operators and members of the civil society, in order to increase the transparency of the reflections already taking place and investigate the possibilities of public participation in policies aimed to tackle NPP ageing. – To assess the possibilities for public participation regarding policies responding to NPP ageing.